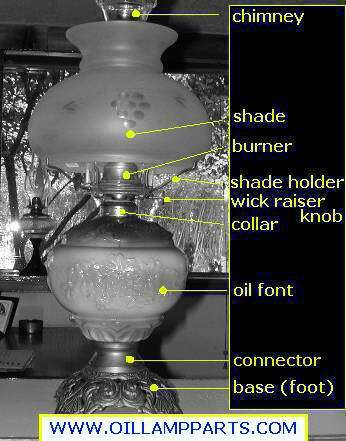 This page contains a brief list of parts of an oil (kerosene) lamp. Feel free to contact me to determine the size and style of parts that you may need to complete your oil lamp! Prices are generally the lowest available on line, and your satisfaction is guaranteed! Font(also fount): A glass or metal container for the lamp oil having a necked opening at the top. Connector: A brass cylinder that supports the font, connecting it to the base (not present on all-glass lamps). Base: An iron, brass or marble piece that is held in place by center threaded rod & supports the oil lamp. Email me if you would like to place an order, have questions or need advice.